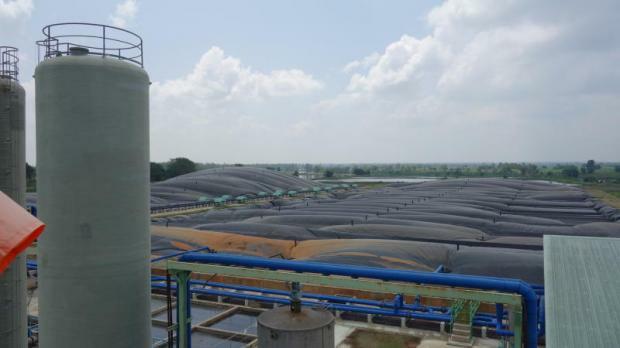 Power is generated using biogas derived from tapioca waste at a starch processing plant. Thai renewable power operators plan to file a lawsuit against a new version of the power development plan (PDP) 2018-37 after seeing it has a lower quota for renewable power generation. Pajon Sriboonruang, president of the Thai Biogas Trade Association (TBTA), said the power capacity quota from renewable energy in the PDP is lower than the association expected. “We are filing the claim against energy policymakers with the Administrative Court [today] to delay the implementation schedule noted in the new PDP,” said Mr Pajon. The PDP 2018-37, approved in late January by the National Energy Policy Council, is set to limit the power capacity for biomass and biogas, although both resources have lots of potential and are abundant, he said. The PDP offers many privileges and incentives for solar power operators, even allowing households to join the solar power scheme, while policymakers plan to allow sales of output to the state grid. The new version of the plan has yet to be acknowledged and approved by the cabinet, waiting for a new government to be formed. Mr Pajon said the new version sets a goal for renewable power to comprise 20% of total power generation by 2037, but that power generation is not expected to connect to the state grid until 2031. The new quota for solar power is expected to account for half of the renewable power capacity in the plan. By 2037, the PDP projects renewable power generation of 18,107 megawatts, with total generation of 73,211MW. Solar power generation is expected to be 12,600MW by 2037, including household rooftop panels and floating solar panels at Electricity Generating Authority of Thailand dams. Biomass resources have a quota of 3,376MW, while biogas is allotted 546MW. Wind is projected to have 1,485MW and industrial waste 44MW. Policymakers have promoted biomass and biogas generation for three decades and many projects are connected to the state grid now and are at nearly full capacity, leaving room for growth. “Although both biomass and biogas are generated from plentiful local agricultural resources, there is no room for operators to expand,” said Mr Pajon. He said biomass and biogas generation offers many benefits to the local economy. Earlier the TBTA talked with the policymakers and they agreed with the association, but they did not meet with the group when forming the PDP. Mr Pajon said the association is calling for new regulations for burning agricultural waste because of the air quality crisis. Policymakers should set rules on use of waste in biomass power generation to solve this problem, he said.